Manjit Bawa was born in 1941 in Dhuri in Punjab. In 1963 he received his diploma in Fine Arts at the School of Art at Delhi Polytechnic. From 1964 - 1971 he travelled from India to England. He taught painting at the Institute of Adult Education, England; worked as a silkscreen printer evolving new techniques. In 1967 he received his diploma in Silk Screen Printing at Warden Institute of Essex in England. In 1970 he had a one man show at Private Gallery, San Sebastin in Spain. From 1967 - 1971 he worked as a serigrapher in London. In 1972 - 1974 he had a solo exhibition at All India Fine Arts and Crafts Society in New Delhi. 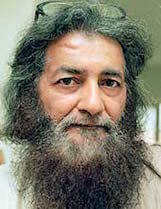 From 1975 - 1977 he was a visiting lecturer at the College of Arts, New Delhi. From 1977 - 1978 he established silk screen workshops and worked as an expert in printing at the Garhi studios, New Delhi. In 1998 he started Sama with Ina Puri to promote arts & artists. Manjit had several solo exhibitions: In 1969 he exhibited at Terrace, London and Percey Hanslow, England. In 1979 he had a solo show at Dhoomimal Gallery, New Delhi. In 1982 he had a solo at Art Museum in Washington DC, USA. In 1984 he exhibited solo at Cymroza Art Gallery, Mumbai. In 1990 he had an exhibition of Drawing at CCA, New Delhi and Birla Academy, Kolkata. In 1991 he has a solo exhibition at Sakshi Art Gallery, Mumbai and he had a solo exhibition of Drawing & Paintings at CCA, New Delhi. In 1993 he had one person show at Roopankar, Bharat Bhavan in Bhopal. In 1994 he showcased ‘Drawings 94’ at Gallery Espace, New Delhi; Miniature Paintings, Silver Boxes and Jewelry at Gallery Espace, New Delhi and one person show at Birla Academy, Kolkata. In 1996 he showcased solo at Gallery Espace, New Delhi. In 1997 he had one person exhibition at Sakshi Art Gallery, Mumbai. In 1998 he had one person show, Impresario at Kala Bhavan, Santiniketan. In 1999 he showcased solo ‘Bhav, Bhaav, Bhavya, Frames of Eternity’ at Sakshi Art Gallery, Mumbai; Academy of Fine Art in Kolkata and Lalit Kala Akademi in New Delhi. In 2000 he exhibited solo at Bose Pacia Gallery, New York; he showcased ‘Exhibition of Miniatures’ in London, UK and at Fine Art Gallery, Mumbai. In 2001 he showcased ‘The Active Line: Five Idioms of Drawing at Guild Gallery in Mumbai; he had one man exhibition ‘Drawing Show’ at Sakshi Art Gallery, Mumbai and Sama in Kolkata, Bangalore and Chennai. In 2002 he exhibited solo in Hong Kong. In 2005 he had one person shows at Gallery Maya and Nehru Centre in London. In 2006 he showcased ‘Making of Divinity’ at Sakshi Art Gallery, Mumbai. In 1963 he showcased in ‘The Six’ at AIFACS, New Delhi. In 1977 he took part in ‘Contemporary Indian Painting’ and ‘Festival of India’, London. In 1984 he took part in Tokyo Biennale, Japan. In 1985 he participated in a group show at Bharat Bhavan, Bhopal. In 1986 he participated in Bharat Bhavan Biennale, Bhopal; he took part in 1st Asian European Art Biennale at Ankara in Turkey and 2nd Biennale in Havana in Cuba. In 1987 he showcased in ‘Coup de Coeur’, Geneva and Contemporary Indian Art at Taj Mahal Hotel, Mumbai. In 1990 he participated in Contemporary Painting at Jehangir Art Gallery, Mumbai. In 1992 he showcased in ‘Images: The Poet & The Painter’ at CCA, New Delhi; Nine Indian Contemporaries at CCA, New Delhi; ‘The Subjective Eye’ at Sakshi Art Gallery, Mumbai and a group show ‘Carpets & Tapestries’ at Sakshi Gallery, Mumbai. He had two people show ‘Colored Pencils’ at Gallery Espace, New Delhi. He participated in a group show at Le Shosde, Paris. In 1995 he participated in ‘Hundred Years of Indian Art’ at NGMA, New Delhi. In 1996 he took part in ‘Highlights’ at Jehangir Art Gallery, Mumbai. In 2001 he took part in the Annual show at CIMA, Kolkata. In 2002 he participated in the Annual show at Vadehra Art Gallery, New Delhi. In 2004 he participated in ‘Face to Face’ at CIMA, Kolkata. In 2005 he participated in Golden Jubilee Exhibition of Lalit Kala Akademi, New Delhi. From 2008 - 2009 he participated in Art at Ravindra Natya Mandir, P. L. Deshpande Kala Academy Art Gallery, Mumbai. He took part in various group exhibitions in Nagpur, Aurangabad, Solapur, Kolhapur, Pune and Nasik. Manjit Bawa passed away in 2008. In 1963 he received Sailoz Mukherjee Prize, New Delhi. In 1980 he won the National Award at Lalit Kala Akademi, New Delhi. In 1981 he was honoured at All India Exhibition of Prints and Drawings, Chandigarh. In 1986 he was honoured at 1st Bharat Bhavan Biennale in Bhopal. In 2002 ‘Meeting Manjit’, a film on Manjit Bawa by Buddadeb Dasgupta received the National Award for Best Documentary.